These standards are black and white issues with us. The standards on the left are the benchmark of our level of quality customer service. The standards on the right are the real issues that we have seen taken for granted, looked over and abused in our industry. 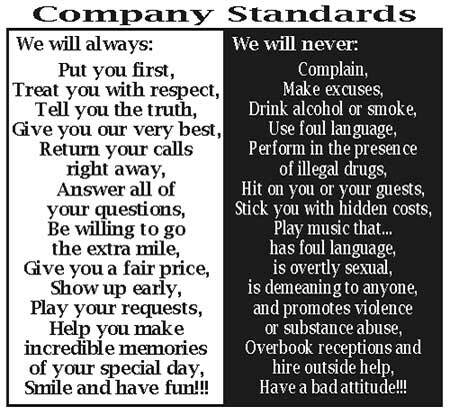 Though we have personally witnessed each one of these standards being broken by our competitors, we are determined that we will never join them in their unethical behavior. These standards were written to give us a clear guideline to work from and to provide our clients with the peace of mind they deserve when they entrust their wedding receptions to our care.